In autumn in the wooded pastures of Spain called dehesas, huge oaks drop boatloads of acorns. The period when the acorns—bellotas in Spanish—fall in the dehesa is so important that they have a name for it: the montanera. 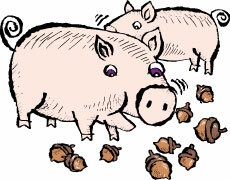 During the montanera, heritage pata negra breed pigs gobble up the acorns as quick as they fall. The pigs that are sacrificed at the end of the montanera produce the most coveted of all Iberico pork, called Iberico de bellota. It’s renowned in Spain because the high fat content of the nuts creates rich, intramuscular fat in the pigs. That fat gives cured Iberico de bellota pork its astonishing, melt-on-your-tongue texture. At Arturo Sanchez, a jamón Ibérico maker in Guijuelo, Spain, they take the acorn diet one step further. They make all of their jamón Ibérico de bellota with pigs that have a double montanera—that is, pigs that have had two autumns out chowing down on acorns in the dehesa. The extra year to bulk up out on pasture makes the pigs quite a bit more expensive to raise, but that extra hit of the acorn diet makes the flavor of the pork even richer. But the attention to detail doesn't stop there. Arturo Sanchez hams age for at least 3 years. All but about 2 weeks of that time is at ambient temperatures, hotter in the summer and colder in the winter. Often the windows in the aging rooms are left open so the cool, dry winds that roll down from the surrounding mountains can blow through and help to slowly mature the hams. If you’ve never tasted jamón Ibérico, it has a deep, intensely savory quality that’s rich, meaty, and a little nutty. Arturo Sanchez hits all of those notes, but at the same time it has a subtlety, almost a delicacy, that I have never experienced in any other jamón Ibérico. The flavor doesn’t hit you in the face the way some jamón Ibérico does; it slowly washes over you, growing and growing for an incredibly long, incredibly pleasant time. It's an exceptional eating experience.